Wet leisure organisations BISHTA and SPATA are encouraging hot tub and swim spa dealers to join forces with their swimming pool company counterparts in helping to promote safety measures around water throughout the summer months. As part of Drowning Prevention Week, which has been initiated by RoSPA and is running until June 26, wet leisure specialists are working to highlight awareness of the number of accidental drownings that happen every year in the UK and promoting products that provide extra security to restrict access to hot tubs, swim spas and pools. Every summer the popularity of recreation in water grows, but with this, the risks to safety grow too. According to Pool Industry Promotions (PIP), on average more than 400 people drown in the UK each year, nearly 60 per cent of these are children and young people. PIP has also reported that ‘swimming’ as an activity accounts for an average of 60 people out of the 400 deaths and although most of these are at outdoor locations, such as rivers and at the sea, there are still an average of five to six people who drown in a swimming pool. A person can drown in as little as 2cm of water, so PIP believes reducing the drowning risk by the implementation of safety devices for home pools, hot tubs and swim spas should be an essential discussion point for any retailer, installer and their customers. PIP is advocating that the most obvious devices that wet leisure professionals will want to recommend are safety covers, enclosures, and fences. Some people may choose to use alarms and SPATA has also ensured that the new European standard for domestic pools recognises the potential importance of having a boundary property fence/wall to reduce the chances of unauthorised access to a swimming pool. BISHTA, meanwhile, is also working closely with other experts to ensure that safety devices are referenced in the European standard for domestic spas and hot tubs. “This voluntary self-regulation on safety has been the fundamental principle by which SPATA, BISHTA and many other Pool and Spa Associations across Europe have acted when developing these standards,” says Sallie; “Although the standards are not Law, they are considered as the relevant guidance that professionals are expected to follow. Essex-based Aqua Warehouse Group; which distributes the Vita Spa hot tub range that has gained its first WhatSpa? Best Buy Award for the Cabaret and a successive Best Buy Award status for the Prestige in the tenth anniversary edition of the consumer magazine, and L.A Spas hot tubs that have the 2016 WhatSpa? Best Buy Award-winning L.A Spas Belmar LX in its stable, have been quick to spot the potential of the Covana Legend CS 1000 as an advanced safety cover for the rapidly-growing British swim spa market to promote to consumers as part of its flourishing Aqua Spa Supplies division. This has resulted in the wet leisure powerhouse, which also distributes the Vita Spa xStream swim spa range, which has received 2016 WhatSwimSpa? Best Buy Awards for the Vita Spa XL4 and Vita Spa XSP and has been updated this year with the new Thinsulate Insulation procedure like its Vita Spa and L.A Spas hot tub counterparts, and L.A Spas In-Fit swim spa range, which has been bestowed with a WhatSwimSpa? Best Buy Award for the L.A Spas In-Fit 13 SL; distributor taking to the road for major promotion of the advanced Covana Legend CS 1000 cover system. This has included high-profile consumer and trade exhibitions at the Birmingham NEC hosted UK Pool & Spa Expo, now renamed as the Hot Tub Living Expo, and SPATEX at the Ricoh Arena in Coventry. 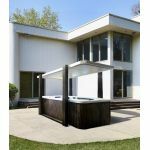 It has resulted in a growing network of showroom dealers providing the Covana system, which has an established hot tub counterpart, as an option for swim spa owners to gain the benefits of an extremely secure cover that ensures overhead protection from rain. One of the key advantages of the Covana Legend CS 1000, pictured, is that it is a totally secure and fully-automated cover system that has been designed to elevate and lower with the simple turn of a safety key switch. This is particularly ideal for owners of swim spas who want to swim solo, but would have to rely on someone else to help them with taking a traditional swim spa cover off. As well as ensuring the task of lifting the cover is not a daunting one, Covana’s sealing system is helping to prevent possible access by young children. Once the cover is completely raised it will provide swim spa owners with the reassurance that it is guaranteed to stay in position until the safety key switch system is manually operated. This system is ideal for swim spas ranging in size from 12ft to 20ft and there is also the capability of optional extension brackets allow the Covana Legend to fit most swim spas manufacturer’s height requirements. Aqua Spa Supplies and its dedicated network of showroom dealers have also recently taken on the USA-manufactured End2End swim spa cover to provide the British market with an additional option that was officially launched at the Birmingham NEC during the fourth edition of the UK Pool & Spa Expo, and also heavily promoted during the 20th anniversary edition of SPATEX at the Ricoh Arena in Coventry. 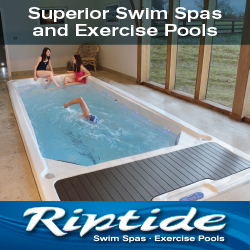 The tough covers have steel frames fitted into their thick and durable covers; which are light-weight and flexible enough to enable one person to easily roll it off partially or fully and are custom-built for swim spas up to 20ft. Certikin International, who distribute the Caldera Spas hot tub ange that has gained a trio of 2016 WhatSpa? Best Buy Awards for the Capitolo, Marino, and Cantabria, and Fantasy Spas hot tub range that is also manufactured by Watkins Wellness; have been promoting the unique Walu Deck decking system that extends over and retracts from the pool to provide a safe and secure cover that can maximise space with its load bearing credentials; as well as highlighting the benefits of the new Walu Air winter debris pool and safety cover. Technical Sales Advisor Warren Davies has been helping with the promotion of the Walu Air cover and believes it is an ideal product for both pool access prevention and for winterising pools. This is due to the fact that it creates an inflated pillow that literally ‘plugs’ the shape of the pool to prevent debris entering and also providing an excellent visual deterrent for children, pets and wild animals. “We’ve had a lot of interest in this product because of the fact that it can be inflated in the middle so easily to provide a completely secure cover,” reported Warren.